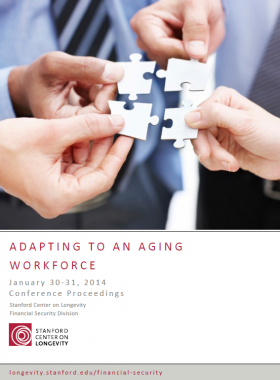 The Center’s first conference about the aging workforce, which convened on the Stanford campus in April 2013, demonstrated the range of employer viewpoints on the aging workforce and made clear that there was a lot more to learn. To continue the conversation, the Center partnered with Mercer to host a second “Adapting to an Aging Workforce” conference in New York. Attendees included numerous employers from large and mid-size companies, as well as academics who study work and aging, and non-profit representatives who think about public policy responses to these issues. The goal of the conference was to address the issues of human capital management and retirement and health planning that employers are facing as they adapt to an aging workforce.